One of our full-time coaches at the Maryland Table Tennis Center, Jeffrey Zeng Xun, is leaving Monday for a month in China. Sun Ting, who recently joined our staff, is also in China, also returning in about a month. I'm subbing for some of their students while they are away so it's going to be a busy month. (Pray for my back!) We'll be back at full strength around the start of February. Around that time is when the wall to our club goes down and we take over the space next door to us, doubling the club's size. It'll probably be another month of renovations before everything's ready, and then we'll have 11,000 square feet, around 18-20 tables all on red rubber flooring, the bathroom that's currently in the middle of the club obstructing everything will finally be off to the side, and we'll have our new weight room. We'll also have a new modernized web page, and our new facebook page will be ready for action. Our coaching staff will then include me, Cheng Yinghua, Jack Huang, Jeffrey Zeng Xun, Sun Ting, Raghu Nadmichettu, and Donn Olsen. The depth of play at the cadet level (which roughly means under age 15) has dramatically increased over the lasts five years in the USA. How did this happen and how much stronger is it? First I'm going to digress to five years ago. In December, 2006, at the USA Table Tennis Board meeting at the USA Nationals, I gave a Junior Training presentation. USATT had struggled for years to find ways to increase the number and level of our juniors, and at the same time was focused on developing elite players. I argued that the solution to both these problems was for USATT to recruit and train coaches to set up full-time training centers and junior programs. USATT was already running coaching clinics; why not just change the emphasis? 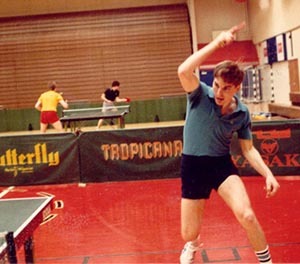 Table Tennis Tip: Pushing and Looping Deep Backspin. Yesterday at the MDTTC Christmas Camp the focus was on backhand attack. That meant lots of backhand smashes, backhand drives and flips against backspin, and backhand loops. I was amazed at how fast some of the "beginner" kids picked up the backhand loop. The old paradigm that you have to be relatively advanced before you can backhand loop has been wrong for many years, and yet it still plagues many junior players whose old-fashioned coaches hold back on teaching this shot, thereby handicapping their games. My general rule of thumb is as soon as the kid can hit 100 forehands and 100 backhands with a good stroke he's ready to learn to loop. This reminds me of a Junior Olympics many years ago where a full-time professional coach from another region was admiring the level of play of the Maryland juniors. She was amazed at how well some of our kids in the 10-year-old range could loop, and commented, "None of my students that age are good enough to learn to loop yet." As she explained, she thought it was assumed a kid needed to be at least 1500 before he should be taught to loop. Yikes!!! This is a common problem with a rather easy fix. Many players go off balance and fall backwards when looping against backspin with their forehand. Why? It's almost always because they are standing too far from the table. And so they have to reach forward to contact the ball. This throws their weight slightly forward; to compensate, you have to lean backwards. You lose control, power, and are off-balance for the next shot. How do you fix this? Stand closer to the table, and rotate more sideways when you loop. The contact point should be the same as before, but relative to your body, it's farther back in your hitting zone, often in front of the back leg. This allows you to rotate in a circle as you loop, creating torque and maintaining your balance even during your most powerful loops. We're in the middle of the Christmas Camp at the Maryland Table Tennis Center. It's our 21st consecutive year we've had a Christmas Camp, along with about 150 other camps, mostly during the summer. (All camps are five days/30 hours long.) I basically run the morning sessions, where I give short lectures and then go into groups where the players rotate, doing multiball with the coaches. Coaches Cheng Yinghua, Jack Huang, and Jeffrey Zeng Xun are the other coaches. Cheng and Jack run the afternoon sessions. Coach Jack Hsu is also coming in during the morning sessions to assist and put in the hours needed toward his ITTF coaching certification. As noted last week, I'll be away for Christmas, so my next blog entry will be right after Christmas. Then I'll return to blogging every morning, Mon-Fri. I had a great time last week at the USA Nationals in Virginia Beach. Here are the results. (Make sure to set the tournament field to "2011 US Nationals.") Ty Hoff and I won Hardbat Doubles (my 12th time at the Nationals or Open, eight of them with Ty, the other four with Steve Berger). However, I was mostly there to coach. Below are a number of segments about the Nationals.